Anyone facing down a major writing chore isn’t up for reading a massive instructional treatise on the task. 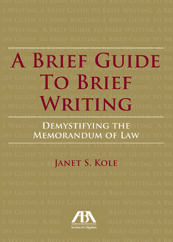 That is why A Brief Guide to Brief Writing (ABA 2013) by Janet S. Kole is so attractive. Pocket-sized and only 132 pages, one can brush up on the main points in only a few minutes, or read its entirety in about an hour. Some of the basic touch points covered in this no-frills book include what a brief looks like, how to write with your goals in mind, and some common hazards to avoid. This tool can be valuable for attorneys who want to brush up on some points, law students seeking the best fundamentals to master brief writing, and for pro se litigants facing the task of writing a brief for the first (and last?) time. So consider taking a minute or two to peruse this gem before you start writing your next brief.